Attention: Thank you very much for visiting my site! : ) I have found a better host for this site, so this will NOT be updated anymore, however, I will post the new URL here soon. I promise you a better quality, faster loading, and more informative Bee Gees site. Due to popular demand, I am adding more VIDEOS on the new site. ^.^ Thanks for your support!! "Three voices. One microphone. Magic." This site is dedicated to my favorite band of all time, The Bee Gees. The Gibb Brothers have created magical songs for 4 decades, their records have sold well more than 110 million copies and counting world wide. And as songwriters, they have written and produced dozens of hits for themselves and other artists including Diana Ross, Kenny Rogers and many more. They are also the only songwriters who managed to have 5 songs on the top 10 hits at the same time. 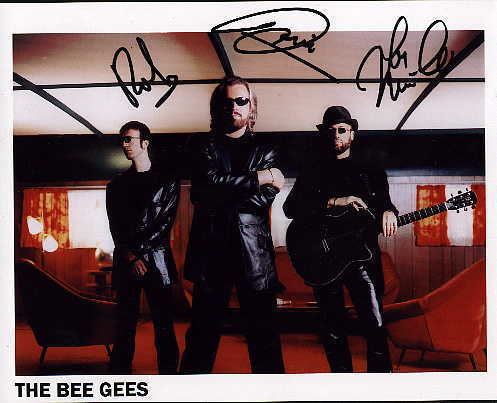 This site will bring you news, information, photos and links to other Bee Gees sites. I will update this site frequently, so come back and visit! And don't forget to check the message board. 17/11 Reviews on "The Record"